In a statement, the Navy said it had lost confidence in Vice Adm Aucoin's ability to command. 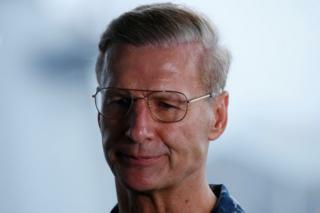 The incident triggered a rare worldwide "operational pause" of the US Navy's fleets as well as a review of operations. The collision left a large hole in the destroyer's port side - the left-hand side of the vessel facing forward - and flooded compartments including crew berths. Five sailors were injured. The destroyer is now at the Changi naval base in Singapore. Ships, equipment and aircraft from the American, Indonesian, Malaysian and Singapore navies have been involved in the search for the 10 missing sailors. On Tuesday, officials announced that human remains had been found in the sealed flooded compartments of the destroyer. They are also verifying the identity of a body found at sea by the Malaysian navy. The Alnic MC sustained damage to a tank near the front of the ship, but none of its crew were injured and there were no oil spills. 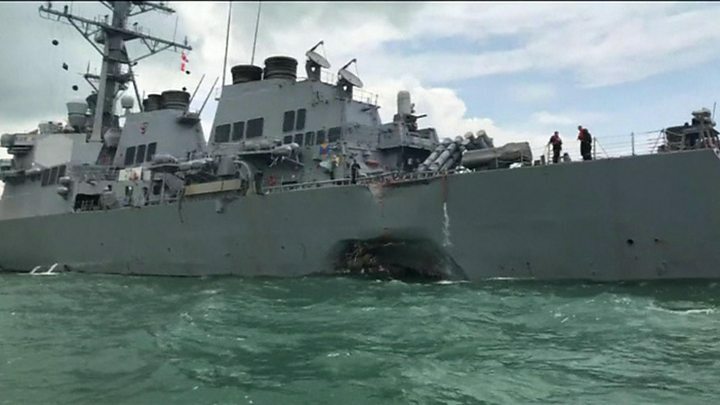 The incident marked the fourth time this year that a US Navy vessel has been involved in an accident in Asia. Two months ago, seven US sailors were killed when the USS Fitzgerald collided with a container ship in Japanese waters near the port city of Yokosuka. In May, a guided missile cruiser collided with a South Korean fishing vessel, while in January another cruiser ran aground near the 7th Fleet base in Yokosuka.